eWorld Procurement & Supply provides a valuable educational platform for you to meet leading technology experts, key suppliers and your immediate peer group – to learn about new products and services, discuss common issues and build mutually profitable relationships. 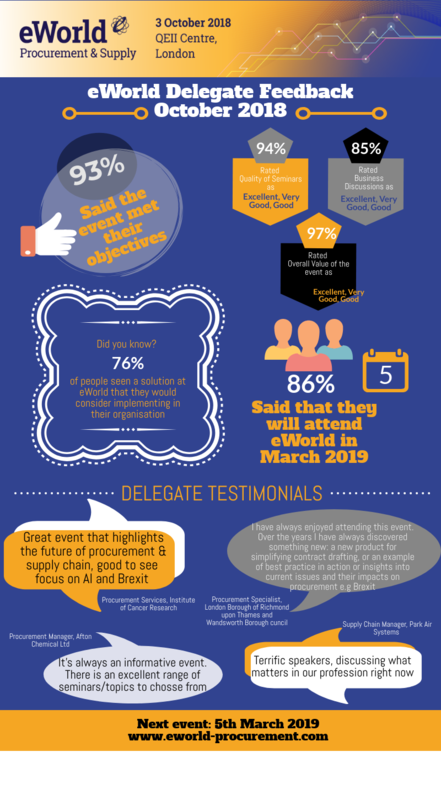 Over 80% of delegates attend eWorld to keep up-to-date and find out what’s new in the industry, helping to make informed decisions, 95% of delegates say that their objectives to attend are met (based on average feedback scores for recent events). A cutting-edge educational programme including briefings on new developments, roundtables for more in-depth discussion and case studies to learn and share knowledge with your peers. With more than 30 cutting-edge sessions to choose from, you can create an event tailored to your personal needs and interests. eWorld Procurement & Supply is targeted at senior business executives from the commercial, public and third sector, with responsibility for implementing or sourcing web-enabled procurement & supply chain strategies and technologies, within their own organisation. Delegates may be from large or small to medium sized business; targeting B2B as well as B2C customers. 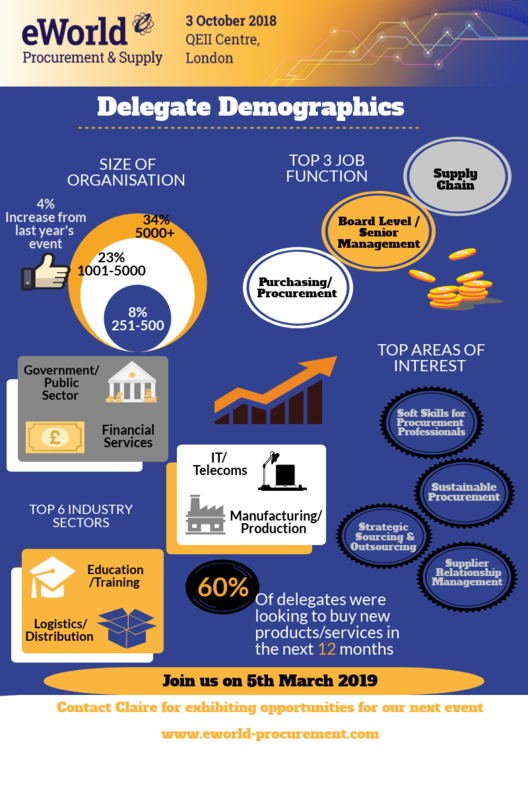 Delegate places at eWorld Procurement & Supply are free of charge to those who meet the above criteria. If your submitted application to attend requires clarification we will contact you. eWorld also attracts CEOs, COOs, MDs and other senior managers who are interested in the impact a successful procurement and supply operation can have on their business. eWorld Procurement & Supply is free to attend for qualifying delegates but we reserve the right to refuse admission.